When Café Shelburne opened in 1969, high cuisine was synonymous with the fine French cookery heralded by Georges Auguste Escoffier — butter-soaked escargots in white wine, potatoes gratin, coq au vin — accompanied by wines from the grand chateaux that dot the French countryside. Here in Vermont, Café Shelburne paid faithful homage to that tradition until 2013, when new owners reworked the menu around modern French fare. Dishes pulled flavors from around the globe and relied less on butter and game than on fresh seasonal produce. That lasted little more than a year: After serving a final New Year's Eve dinner in 2014, the beloved restaurant closed its doors. 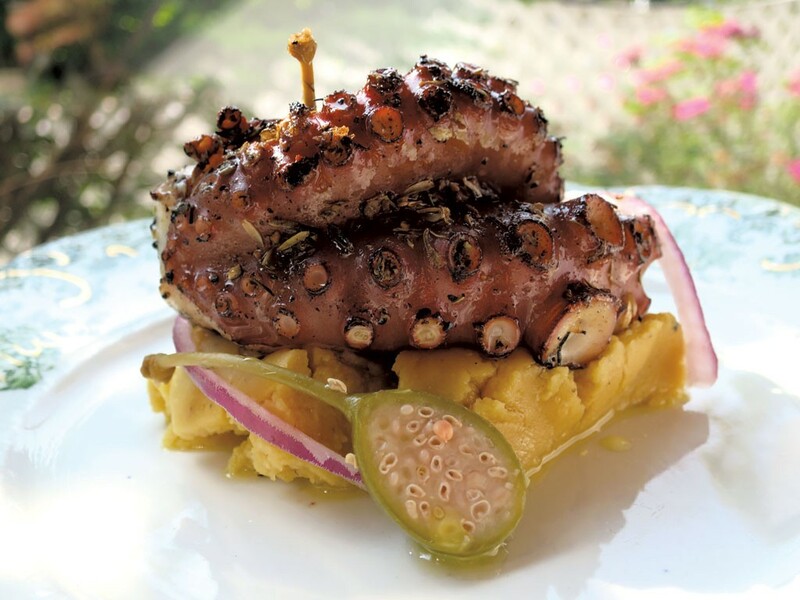 Soon after, chef Marc Provencher (who did a stint at Michael's on the Hill in Waterbury in the mid-2000s) returned from Maine, where his two Greek/Italian restaurants garnered rave reviews. They remain open today — though he's no longer involved — and helped put Brunswick on the culinary map. When Provencher took over the old café space, he swapped its country-home décor with more casual seating and painted the walls a penetrating royal blue. 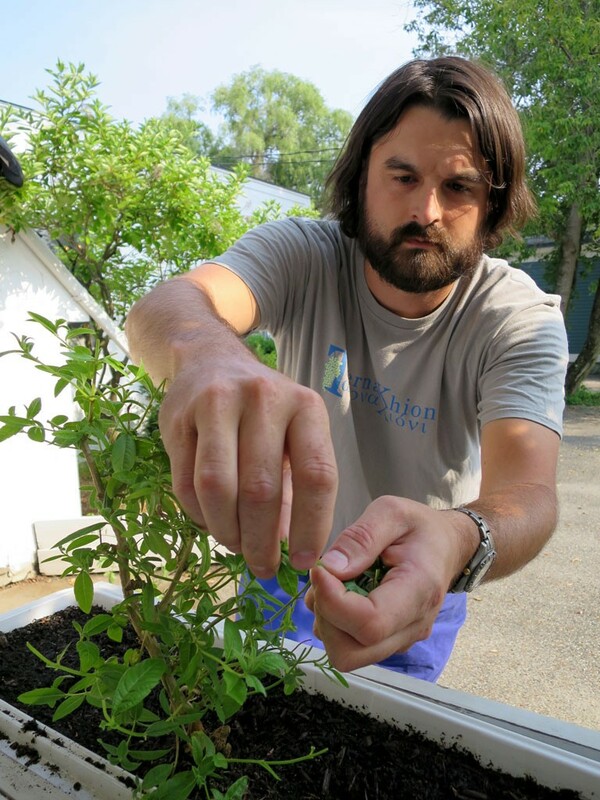 He planted the window boxes with herbs and, in early April, opened Taverna Khione, a modern, forward-thinking Greek restaurant. While the restaurant's shingled white exterior could evoke a seaside cottage, the bill of fare is more countryside than beachfront. Sure, there's seafood aplenty, but land-roving sheep, goats, beef and other cloven-hooved critters trot through the menu, lending their muscles and organs to the Grecian table as they have since the great feasts of Homer's Odyssey. 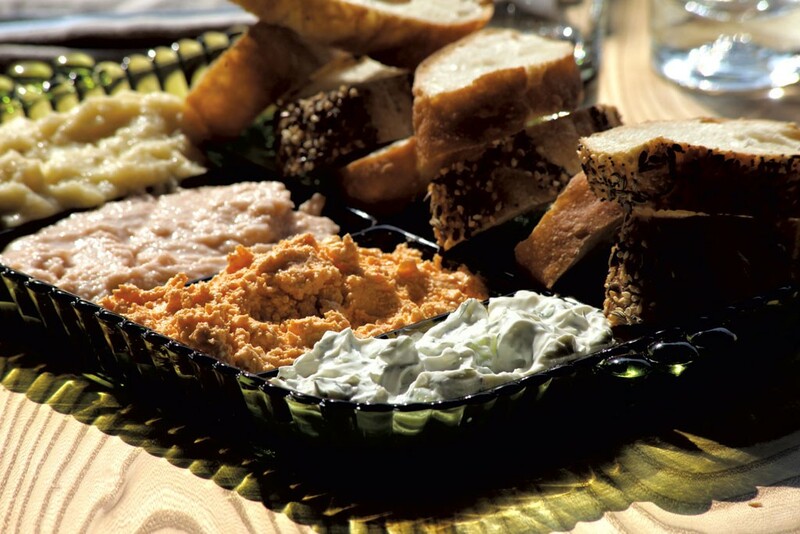 Provencher presents contemporary takes on traditional Greek cooking, handmade in-house with local ingredients. The menu changes monthly, as dishes are built around the best available meat and produce. And while the chef has Greek roots in his maternal bloodline, his affinity for this particular cuisine seems to come more from a studied passion than from familial connection. Behind the bar, staffers pour house cocktails and canon quaffs. One night, an aviation was a loyal rendition of the classic: violet-gray with crème de violette, fruity with lemon and maraschino liqueur. Its boozy kick reminded me that I was, after all, drinking a gin martini. 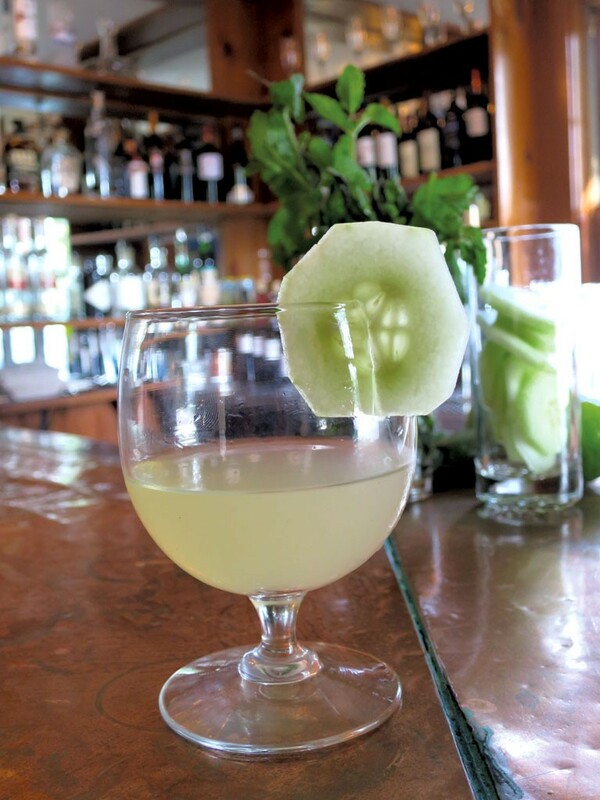 The Better Call Saul was more relaxed: a sunny vodka cooler with cucumber and citrus, St. Germain and mint. The bar offers a handful of draft beers, including stellar brews from Fiddlehead Brewing, Maine Beer Company, Queen City Brewery and Zero Gravity Craft Brewery. But a quick glance at the wine list reveals the restaurant's vinous heart. "You are in a nice Greek restaurant," the index seems to say. "Drink Greek wine." Every option on the list hails from the Hellenic republic. The bar's 50-odd bottles represent the first Greek wines to be imported to Vermont — before the restaurant opened, the wines weren't sold anywhere in the state. Provencher said finding an importer willing to gamble on the unfamiliar vintages was a challenge. The several wines I tasted over two visits (all white or pink, since it's summer) were bright and food-friendly. On a brisk June evening, a sparkling KirYianni Akakies rosé was dry and crisp with straw and strawberry on the palate. It was as pleasant as any Provençal pink I've sipped in recent history. Later, a mineral-y, citrus-soaked Gentilini Robola was cordial company for a sizzling pan of feta dip (bouyiourdi), stained savory red with tomato and red pepper. Spooned onto a baguette from O Bread Bakery, the salty cheese was like a crumbly spinach-artichoke dip: rustic but elegant. That description fits the homespun décor with its pretty, mismatched dishes and flaxen napkins. Service is similarly laid-back, but always kind and polished. Provencher's capable staff tend to every need efficiently but without hurry, and dining under their care feels fluid and friendly. "How did you hear about us?" our waitress asked on my first visit, delivering a plate of grilled octopus (htapodi). Not wanting to reveal that I was there to review the place, I mumbled a little white lie. 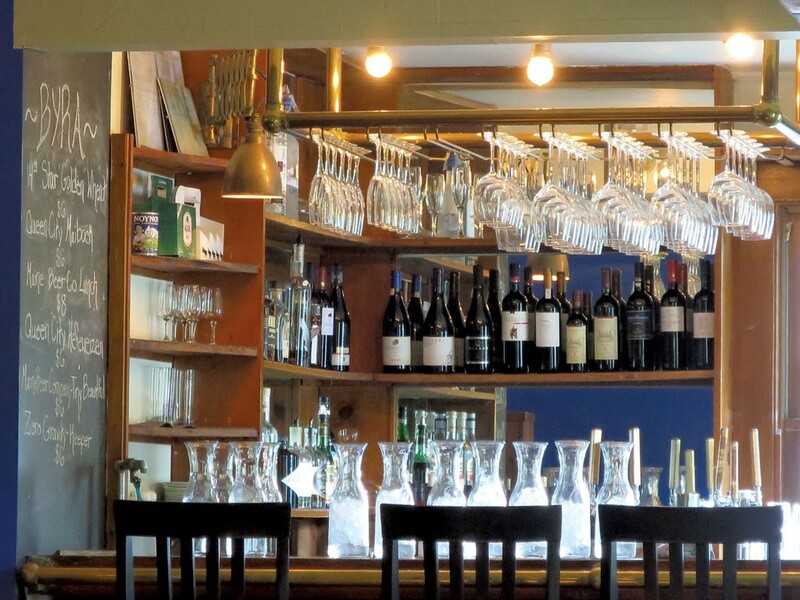 She noted that, located in a town where the median age is around 47 years old (compared to 27 in Burlington and 36 in Chittenden County), Taverna generally serves a retirement crowd. Indeed, the dining room was filled with graying couples. As she took her leave, we snapped into the springy cephalopod, its two tentacles curled around a dollop of pureed fava punctuated with caper berries nearly the size of figs. The briny creature was soft enough to cut with a butter knife, the fava robust with beany richness, and the capers pickle-y and pungent. The tentacles stiffened as they cooled, and chewing them revealed more than a few grains of sand, so the dish wasn't perfectly executed. But despite its shortcomings (which weren't horrible — I'd order it again), the plate was thoughtful, intense and uncompromising. What chef dares to serve mostly whole mollusks to the good people of Shelburne? On a second visit weeks later, a dip sampler seemed tame by comparison — until my guest and I started spooning the spreads onto bread. A cool potato mash recalled a mellow summer salad, but the dense, dill-laced tzatziki, made with imported Greek goat's-milk yogurt, was spicy with raw garlic. The taramasalata — a traditional purée of carp roe, onion, lemon and soaked bread — gave us pause. "I have a feeling that's a flavor you have to grow up with," said my friend, staring at a fishy bit of bread. If the carp flavor was intense, the htipiti — a smooth, spicy purée of feta and grilled hot pepper — exuded a Greek-grandmother quality. Both elegant and blunt, its peasant charm was repeated throughout the menu. Provencher's cooking is pastoral, his presentations spare, and it's impressive when he really nails it. 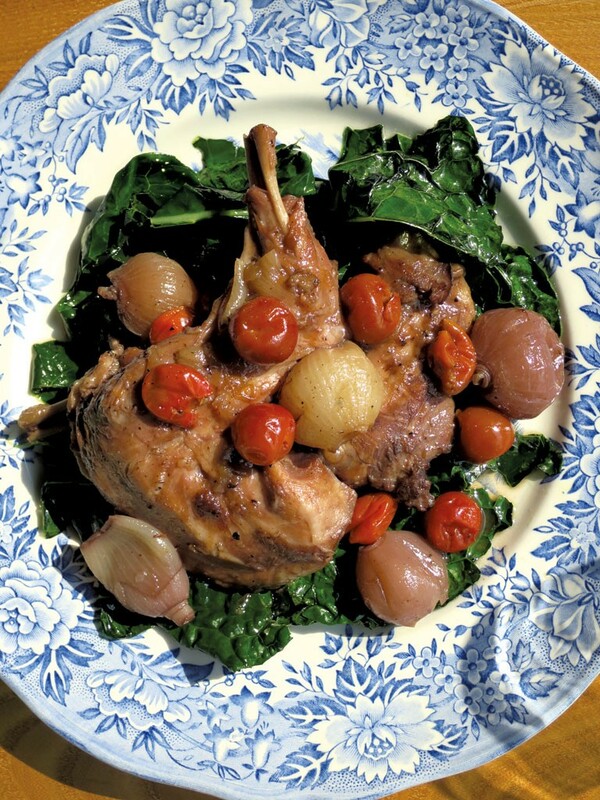 A leg of rabbit, braised in red wine until it fell easily from the bone, was resplendent with stewed sour cherries from Shelburne Orchards, pearl onions and wilted greens — a refined but unpretentious dish with a country heart. 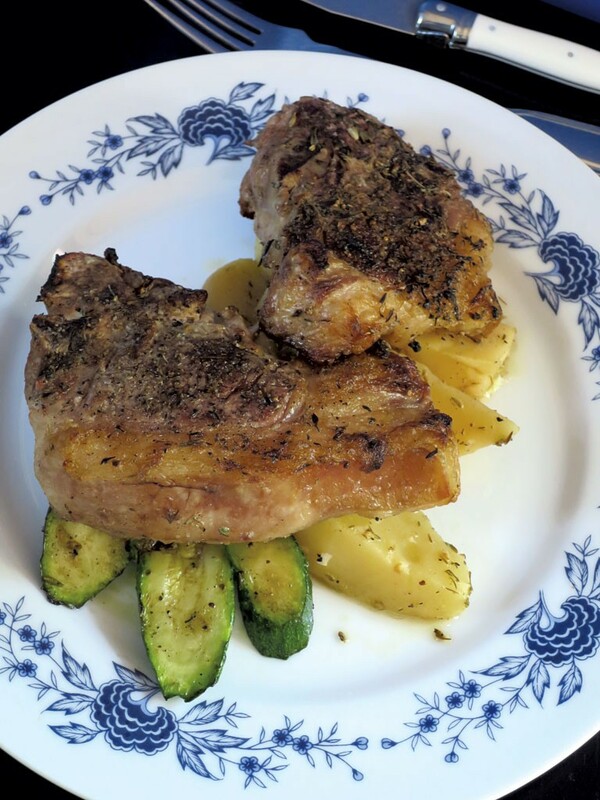 Another night, a pair of grilled Maine lamb chops, dry-rubbed with just salt, pepper and oregano and served with lemony roasted potatoes, were magnificent in their fork-tender simplicity. Similarly unassuming was a tangle of Greek spaghetti (makaronia), flecked with bits of nutty myzithra — a fresh, firm goat cheese native to Crete — and aromatic, fresh-picked verbena. Revealing the knobby imperfections of handmade noodles, the pasta was cooked to an ideal al dente and sweetened with brown butter. Pasta also appeared on the specials list one night, tossed with braised goat shoulder in a comforting tomato sauce warmed with allspice and bits of goat liver. The goat was lovely, but the pasta clumped together. The dish seemed better suited to a cold winter's night than a humid summer eve yet still suggested a Sunday family supper in some far-away village. And the thing about Sunday suppers, as any host can tell you, is that not everything is always perfect. As restaurant guests paying good money for a meal, we tend to expect flawless execution every time and thus are often disappointed. But the success of a dish falls along a spectrum, and most land somewhere between sublime and inedible. I admire a restaurant willing to gamble on a dish in order to serve something new and interesting, so I was more than willing to grant a pass when Taverna didn't score a perfect 10. Even the least successful plates were solid sevens. On both visits, the desserts — a smooth, delightful custard one night, ice cream and sorbet the other — ensured that any missteps were long forgotten before we left. An opulent scoop of coffee ice cream packed the subtle texture of finely ground coffee beans; a bit of lemon-thyme sorbet, with its palate-cleansing, citrus lightness, was its polar opposite. Though these were both made in-house, the menu doesn't mention it. Provencher seems self-assured enough in his cooking that he doesn't need to brag. The pasta, too, is handmade on-site (labeled simply "pasta," in Greek), and the eggs probably came from some nearby roost. But rather than using his menu as a pulpit for his farm-to-table mission, the chef seems to hope that excellence, when he achieves it, will speak for itself. The original print version of this article was headlined "Hellas Good"